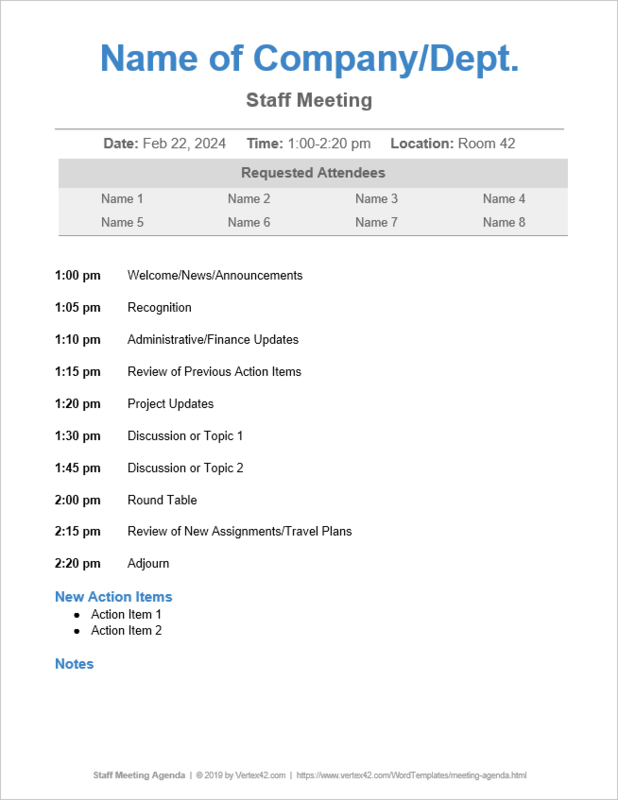 Whether you need a basic meeting agenda, an executive board meeting agenda or a PTA committee meeting agenda, Vertex42's agenda templates can help you get started. Simply choose an agenda format that best meets your needs. 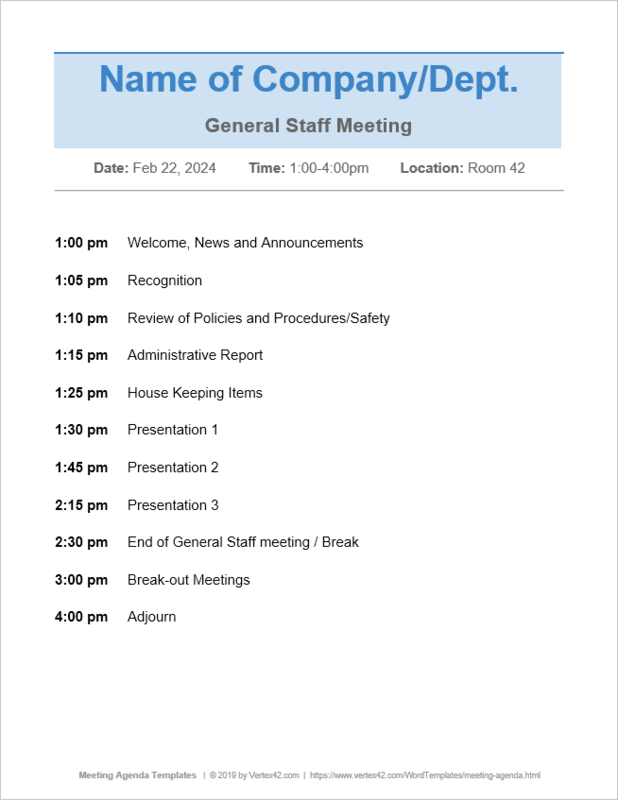 Be sure to scroll through the entire page to see all the sample meeting agendas. Download one of the templates that is closest to what you want, then customize it based on ideas you may have seen in the other examples. The Vertex42 meeting agenda templates below can be downloaded for free, but are copyrighted and subject to the license agreement below. License: Private Use (not for resale or distribution, but designed to be shared with those attending the meeting). 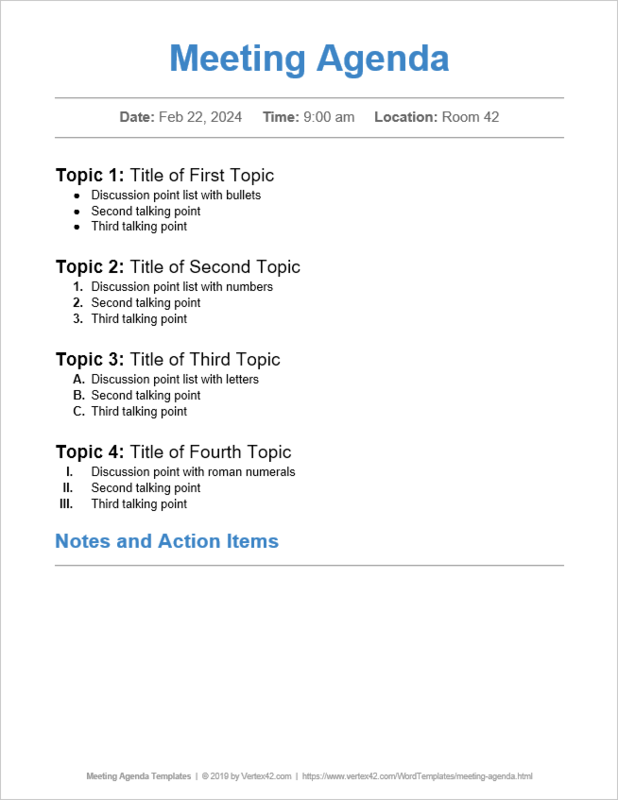 This meeting agenda template keeps things simple and offers a variety of ways for you to organize your meeting's discussion points. The lower portion provides your attendees with a space to write down important notes and action items that pertain to them, making this a useful agenda format for printing out if attendees are still using paper and pen. This template uses custom font styles to make it easy to maintain a professional look and feel as you add more topics. A staff meeting agenda ought to look clean and professional and should be easy to update. This template suits that purpose just fine. Although it doesn't hurt to have at least one printed copy of your agenda, consider using an agenda that staff can access in real time (using Office 365 or Google Docs). If there is any question about who should attend, include a list of requested attendees as demonstrated in this template. If you use Outlook or other scheduling software to manage meeting invites, the list of attendees within the agenda may not be as necessary. See polleverywhere.com for a useful article that describes steps for running a staff meeting. This agenda has a professional business design and is very easy to update and customize for a large staff meeting, conference session, workshop, or pretty much any other meeting that uses a time-based schedule. In general, this format would tend to be used as a general overview of the schedule rather than an agenda that would be edited in real-time with notes and action items. 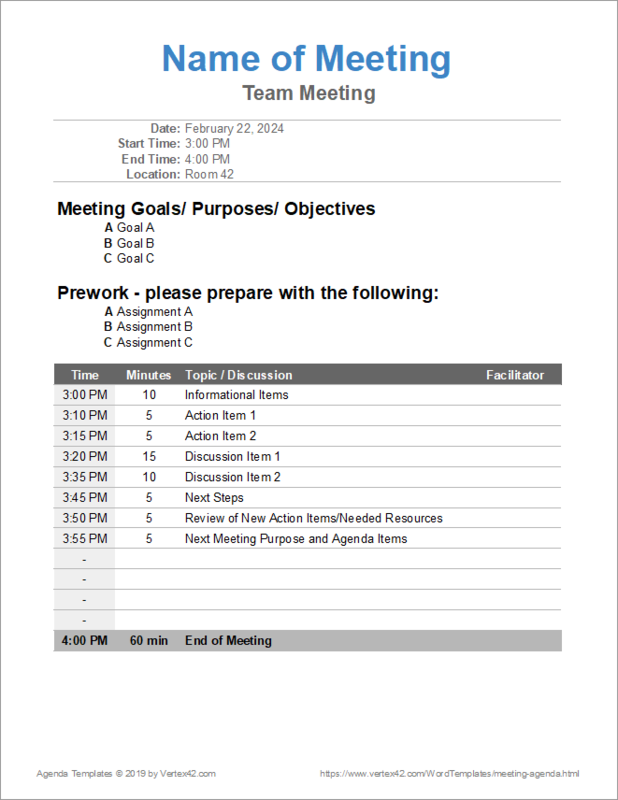 This agenda template allows you to provide your project team with an outline of your meeting ahead of time so they can come prepared, making your meeting more effective. The schedule section has an allotted time column where you can specify how many minutes you'd like each topic or discussion item to take. There are many different methods and strategies for holding effective team meetings, so we designed this template to be easy to customize. Hold team meetings at the same time and place each week. Send the agenda out prior to the meeting. Make sure you identify what you hope to accomplish. Give recognition for progress made. Be careful to recognize team efforts and not just individuals, because recognition given to a single person for a team effort can quickly cause resentment among those who did not get recognized. For example, “We'd like to recognize Sarah and those that worked with her on project X for the amazing progress they've made." Look toward the future. Spend more time on solving problems and creating plans instead of just status updates that could be given by email or other more efficient methods. Place the agenda in a place where everyone has access and can review and contribute. Add notes/minutes directly to the file so everyone can review. Maintain a list of action items separate from your agendas and minutes, so you have a single place everyone can go to view their action items. Assign someone to update the action item list in real-time during your meetings. This spreadsheet-based agenda template can help you plan a meeting that has a specific time limit. Examples might include conference schedules, church meetings, funeral programs, wedding programs, etc. 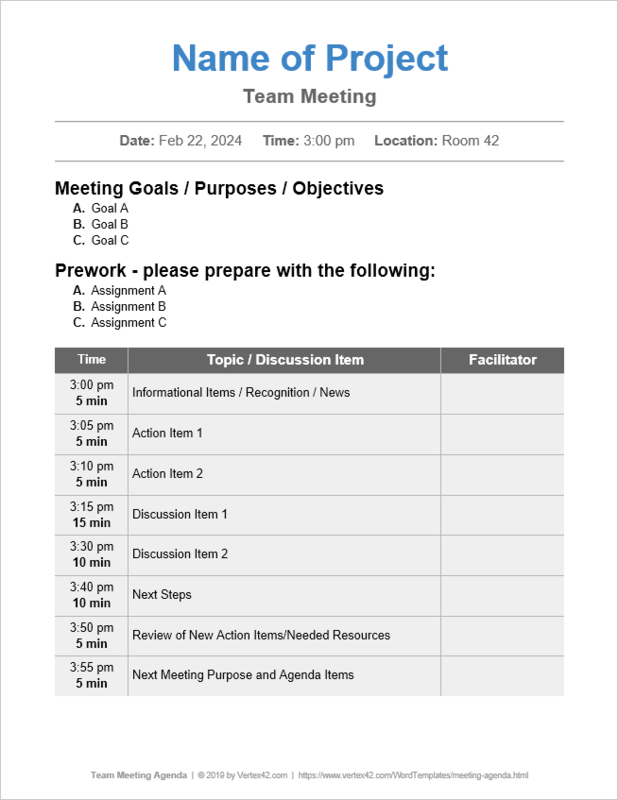 You wouldn't necessarily use this for creating a printable bulletin or program (those tend to be more fancy), but it can be used to help plan these types of meetings. Enter the start time and then enter the estimated time in minutes for each part of the meeting. The spreadsheet calculates the start time of each item for you. Whether you need a board meeting agenda, team meeting agenda or a sales meeting agenda, this template will help your meeting stay focused and on track. Simply fill in the critical information and distribute prior to your meeting so that everyone is prepared for your vital business discussions. This version of the business agenda uses Tables to aid in the layout of the information. This standard committee meeting template is perfect for PTA meetings, Neighborhood meetings and Club meetings. It is prefilled with typical meeting activities. Fill in the details and add your discussion items to help your meeting stay productive. This version contains the same information as the Outline Format above, but it uses Tables to aid in the organization of the information on the page. Tip: Take notes on your copy of the agenda during the meeting to help you generate coherent meeting minutes. Customize this template for your board of directors or executive board meeting. Corporate board meetings have a more formal agenda than many other types of meetings, but template was designed to be simple to edit. For example, if your meeting has different presenters, you can change the Action column to be used to list your presenters. Below are tips we have found that help take the difficulty and stress out of the meeting preparation process. Start planning early. It takes time to get Board Books together (for corporate boards). Make sure your meetings are scheduled far in advance. Decide on a cadence (typically quarterly). Send agendas out at least 2 weeks prior to the meeting. Add times (in minutes) to help show due diligence was used to plan each item. Keep agenda items to a minimum. Include strategic items, administrative items and Board-related items. Corporate governance law requires good minutes and certain items be discussed, also roll call (see this article for more information). Running Effective Meetings at mindtools.com - Talks about the importance of establishing and sticking to an objective. How to Run an Effective Meeting at bnet.com - Using a meeting agenda effectively is one of the keys. This article explains some important points. Formal and Informal Meeting Agendas - A formal agenda may follow the Robert's Rules of Order, while an informal agenda is just a useful way to list topics and presenters. There are examples of both. 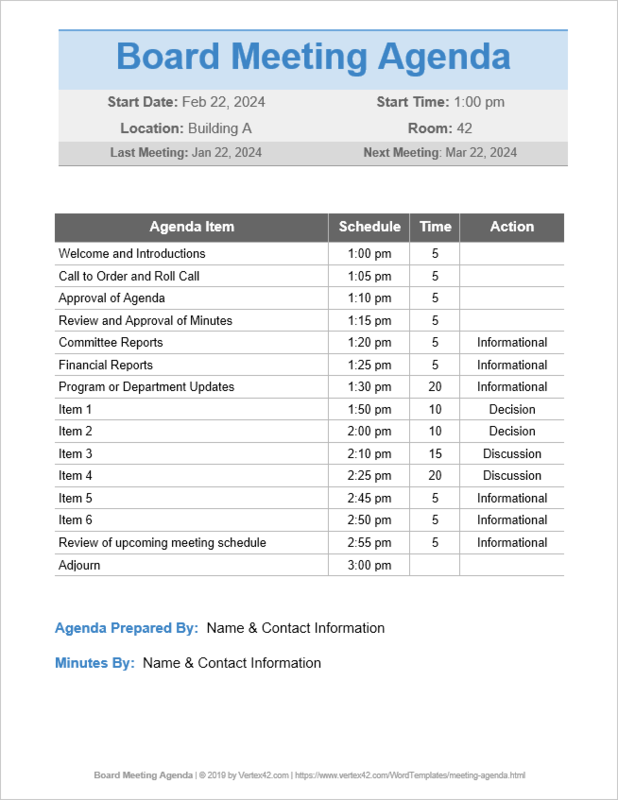 Community Meeting Agenda Template - A simple agenda useful for non-profit organizations, clubs, and other groups that need a fairly formal meeting structure. Team Meeting Agenda - This agenda includes a list of topics and a list of presenters and the allotted times for each presentation. All Day Conference or Workshop Meeting Agenda - Communicates times and places for meetings or workshops, including times, topics, who is presenting. PTA Committee Meeting Agenda Template - You can use this as a guide for running your school PTA meetings. Conference Agenda with Tracks - When you have a large conference, then you may want to divide the sessions into different tracks based on topics. You may want to search for "conference schedule" rather than "agenda" if you are looking for something like this.